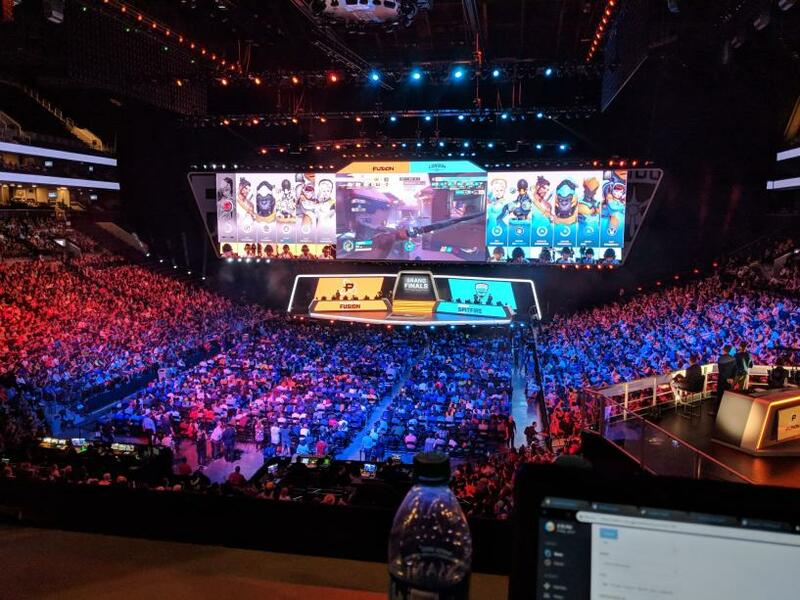 It didn't take long for the Barclays Center to fill up Friday night to see the Philadelphia Fusion	 Philadelphia Fusion OWL Rank #7 Boombox Isaac Charles flex support Poko Gael Gouzerch off tank Carpe Lee Jae-hyeok (이재혁) dps EQO Josh Corona dps SADO Kim Su-Min (뜨용) tank neptuNo Alberto González support and London Spitfire	 London Spitfire OWL Rank #4 Bdosin Choi Seung-tae (최승태) flex support Fury Kim Jun-ho (김준호) off tank birdring Kim Ji-hyuk (김지혁) dps Profit Park Joon-yeong (박준영) dps Gesture Hong Jae-hee (홍재희) tank NUS Kim Jong-seok (김종서) support begin the first match of the final set of the Overwatch League season. 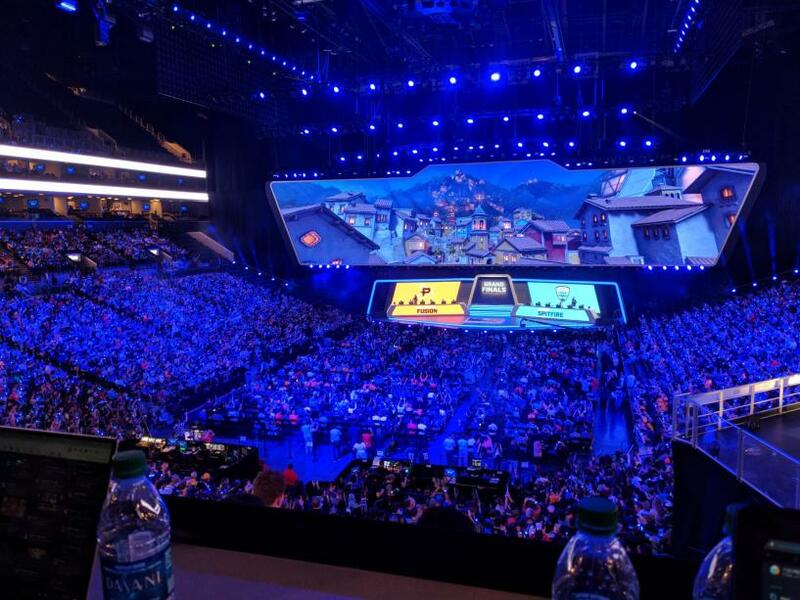 The first sight of the players came about halfway through Watchpoint when they stepped onto the stage to prepare their equipment. 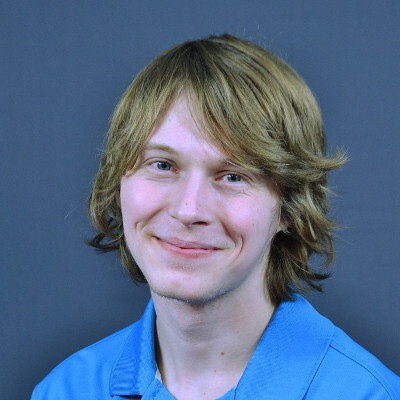 The crowd quickly forgot about Custa, who was at the desk for Watchpoint, and erupted into applause drowning he and the rest of the desk out. Half an hour before the match was set to start and the crowd was ready. As the players were announced on stage, it quickly became clear the crowd was in favor of the Fusion. A city normally unfriendly to Philadelphia sports teams had welcomed the Fusion as their new home team following the elimination of the Excelsior. The arena became drenched in blue as the stage took on Dorado's background and fans' wrist bands lit up with LED lights. 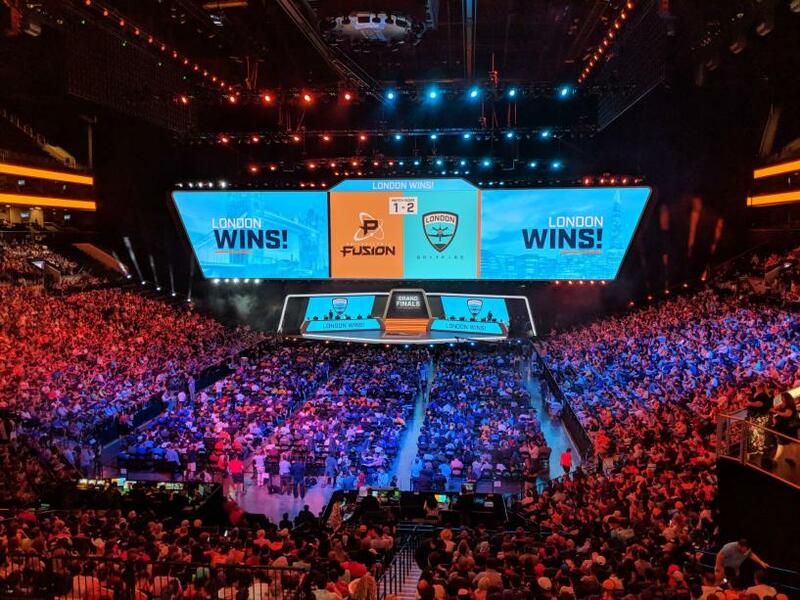 Almost eight months after the first match of the Overwatch League began, the grand finals had began. The only thing louder than the in-game volume was the cheering of the crowd once the match started. A sound that only grew in volume as players got clutch picks and hit impossible shots. The Fusion started on attack and made it through the first point with relative ease, only to have their momentum halted in Dorado's street phase. After being stalled for a couple of minutes, a Self-Destruct from HOTBA and a few headshots from Carpe opened up the defense. The team had little time to spare entering the final point. Despite their hot start, the Fusion seemed doomed to fall short of a completed map and found themselves out of time with the cart still around the corner from the last point. 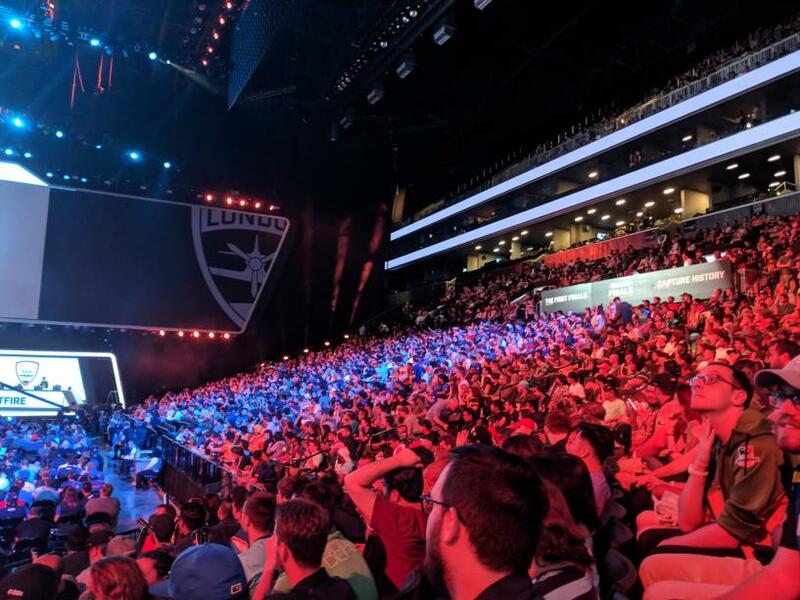 However, the team found their way through with pick after pick to slowly push through and finish the map out in an overtime push that brought out cheers from the crowd. The Spitfire had a similarly easy first point attack, but unlike the Fusion, they found little trouble in the streets. The Spitfire had well over four and a half minutes to capture last. That was when the team finally met some resistance. SADO earned the opening picks of the first fight on last thanks to a Primal Rage, and Spitfire's momentum was halted. Even in fights that seemed to be going in their favor, the Fusion would turn it around, not even able to stop neptuNo from picking NUS. With less than a minute left, the Spitfire finally started to regain momentum and found themselves just meters away from the end of the map with seconds remaining. The Fusion regained their footing and stalled the cart in overtime. The first map went to the Fusion, and the crowd was ecstatic. The next map was Oasis, where the Spitfire were hopping to turn around the Fusion's earlier momentum. The opening stage was University, where neither team could take control initially. The Spitfire wound up grinding it out to take the point, and they were not keen to give it up. The Fusion didn't retake until the Spitfire had gotten 99%, and only took the point in overtime. The Fusion held for as long as they could, but lost the point before they could get it to 50%. 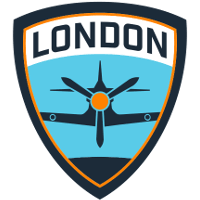 The Spitfire held off the Fusion's overtime efforts and the Spitfire faithful finally were able to make their voices heard. On Gardens, just like University before, neither team could establish a hold on the point right away. The Fusion were able to finally take it, but lost it after racking up 41% to a round victory. When the Spitfire grabbed it, they wouldn't give it up. 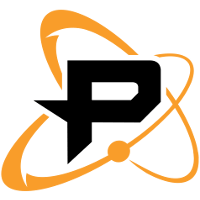 The Spitfire thwarted attempt after attempt by the Fusion to retake the point, as the team in orange had ultimate after ultimate negated. The Fusion thought they may have had their chance to retake with an EQO Rocket Barrage, but instead saw his damage cancelled by a quick Bdosin Transcendence and wound up dead to Gesture's Primal Rage. The momentum had been turned within a map. It was a tied set heading into halftime. The audience was welcomed to the caste of Eichenwalde with a light blue wash covering the stadium. The Fusion brought out a surprise in the map, taking flex support Boombox out in favor of flex tank Poko. The first team to siege the castle was the Fusion, who began attack with a three-DPS combination that featured HOTBA on Tracer. After stumbling in the first couple of pushes, the Fusion broke through the Spitfire defenses to take the first point. The Spitfire recovered immediately, however, and stabilized almost immediately after the gate. After Bdosin took care of a hungry HOTBA, the Fusion Tracer was forced to switch over to Zenyatta. The streets attack finally began to open up for the Fusion following a Self-Destruct from Poko to get a double kill. As his team pushed the cart underneath the bridge, he found himself another Self-Destruct kill, this time on the enemy Mercy. Poko's signature bombs would not be enough for his team, however, and the Fusion would run out of steam underneath the bridge, well short of the second capture point. The Spitfire opted for a triple tank composition on their attack as opposed to the Fusion's triple DPS offense. The composition struggled to get going at first, but with a little under a minute left they were able to capture the first point. They immediately switched to a three-DPS dive, spearheaded by Bdosin's switch from Roadhog to Tracer. Bdosin's Tracer gave Carpe's Widowmaker no room to breathe, taking him out close to spawn. Already in a five versus six, the Fusion were unable to hold off the charging Spitfire. The team in blue rolled through the third map to go up 2-1 in the set, and were one map away from taking the opening match of the series. Poko remained in for Volskaya, leaving Boombox on the bench. Once again, the Fusion started the map on attack. 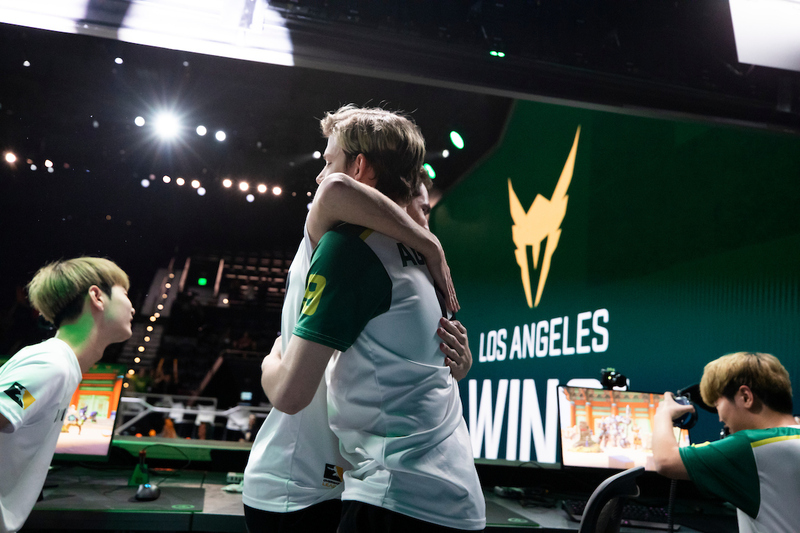 After scouting the Spitfire defense, the attackers switched to a 3-3 composition, commonly known as the GOATs composition. The defense had a triple tank composition of their own, with Bdosin manning Roadhog. For awhile, the defense seemed to work. With a little over one minute left on their attack, EQO used a Graviton Surge while Poko left his Self-Destruct in the middle. The volume of the arena began picking up, surging to a roar once the Self-Destruct went off and secured the first point. The attackers carried the momentum into the next point, getting nearly two ticks before the Spitfire stabilized. The Spitfire brought out Mei for their defense, and Profit quickly made himself known on the hero. A Blizzard and a few headshots later and the audience was making Profit's Mei play known as well. He would switch back to Genji as his teammates ran a form of dive composition with Birdring on Hanzo. On the other end, the Fusion ran a double sniper composition with HOTBA once again on Zenyatta. The Fusion wouldn't recapture their momentum, and ended up never getting more than 57.1% of the second capture point. The defense for the Fusion was the same as the Spitfire's, while the Spitfire ran a bit of a different composition out of the gate. The Spitfire played with dive, except Zenyatta was replaced with Ana. The Nano Boost/Dragonblade combo failed to secure the point as the Spitfire expected as a result of the Fusion's spacing when they saw the blade. Right as Profit was about to hobble away with nothing, neptuNo put him down with a few well placed Mercy shots, sending the crowd into a frenzy, a frenzy that continued as neptuNo killed his counterpart in NUS. With their combination a failure, the Spitfire swapped to a triple tank composition with Gesture on Orisa and Bdosin on Roadhog. Time was not on their side, and it looked certain the Fusion would hold, until a Fury Self-Destruct opened it up for the Spitfire to capture the point in overtime. Birdring opened the fight with a pick on neptuNo, making it seem certain the point and match was the Spitfire's. 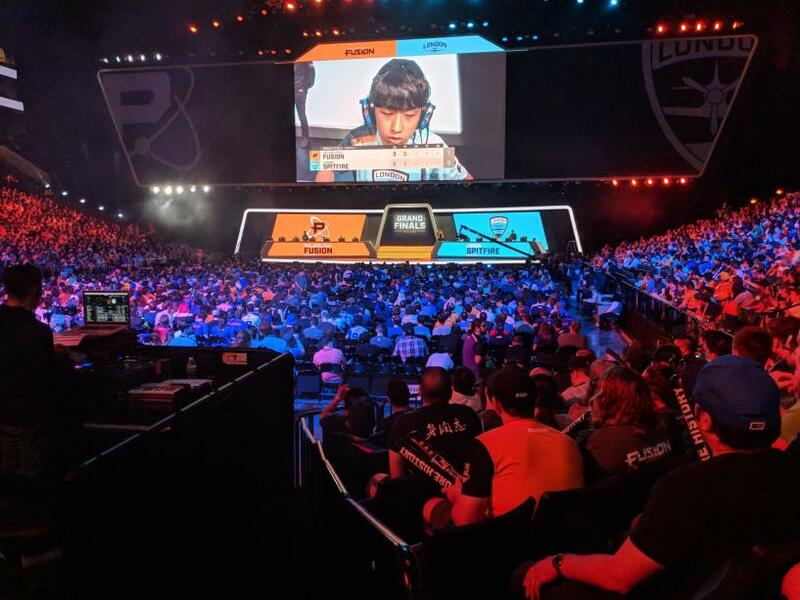 Instead, Poko landed a Self-Destruct earning three kills, making the arena hit new peaks for volume and even getting a reaction from the otherwise quiet press. Profit answered with two kills, turning the tide back in the Spitfire's favor. However, SADO made it back onto the point just in time and the rest of his team followed by cleaning up the remaining kills. The Spitfire managed 56.4% capture. The star of the Spitfire would not be denied. After a few failed captures, he would turn to Tracer and carry his team with less than 20 seconds remaining with several kills. The Spitfire would capture the point and take the map. The opening set would end in the Spitfire's favor, 3-1. Up until the second half of Volskaya I was honestly thinking that Fury had a really good case for MVP of Playoffs, but if anyone but Profit gets it at this point it's a crime. Should let spitfire play for team Korea.